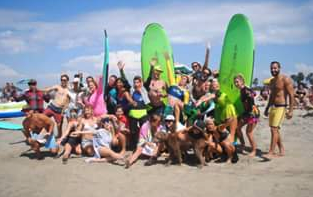 Don't miss an opportunity to let your inner Kook out, to laugh with others or to volunteer to serve our San Diego Surfing Community. That's right the 2nd Annual Whomp-etition for Groundswell Community Project is on Sunday, Sept. 9th from noon to 9PM in OB (Dog's Beach). Be sure to sign up at: https://www.facebook.com/events/225392418095428/ to compete, volunteer, etc. 5: Surf something: bring something that floats and surf it to honor our Cuban surf family who grew up surfing refrigerator doors, plywood, and desk tops! *Heats will start at noon with the final heat at 5pm inviting all the heat winner to whomp-ete for a final wavestorm wipe-out winner! *We celebrate equality in the waves! all heats are for all genders! *Costumes are awarded extra participation points! Get wacky!!! make donations at Groundswellcommunity.org or Via Venmo (@groundswellcp) with your name and heat you would like to Womp-ete in. -10 spots per heat so hurry and sign up so you get the heat of your dreams! *if you would like to donate a soft top at the end of the day to Groundswell Community Project will be bringing surf gear to communities in Cuba and Peru this winter to help build sustainable women empowerment surf clubs! The gift of surf gear gives the gift of strength, beauty, and dreams!